John has worked both nationally and internationally at some of the best establishments in the world and has a proven track record of running and being an integral part of some very successful and innovative kitchens and restaurants. In his last full time role, John expanded his knowledge to cover the front of house areas, as F&B Director and Executive Chef at the Grove Hotel, Hertfordshire, which has given him a greater understanding of the service side of an operation.John’s career has taken him to Europe, Asia, South Africa and Dubai, working only in 5* establishments including the Vier Jahreszeiten in Hamburg, the Mount Nelson, Cape Town, and the Island Shangri-la, Hong Kong. 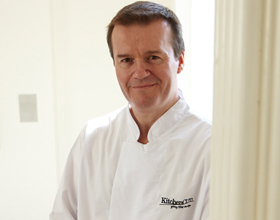 He also worked extensively in the UK at the prestigious Savoy, The Dorchester and the Cliveden hotels. The latter at which John gained a Michelin star in Waldo’s restaurant. After many years in large operations, John’s desire to prove himself in a standalone restaurant operation led him to take the position of Executive Chef at the highly successful Chapter One on the outskirts of London. He also set up and opened a second operation during his time there, Chapter Two in Blackheath. The lure of the world famous 7 star Burj-al-Arab hotel in Dubai was enough to tempt him back into hotels for his final executive chef position. John has achieved a Michelin star, 4 AA Rosettes and 8 out of 10 in the good food guide, all of which prove his outstanding ability in a kitchen brigade, whilst always remaining focused on the financial success of a business. John has managed international teams from 10 to 500 chefs in award winning multi outlet operations with large banqueting operations, catering up to 5000 covers. After working as a chef for over 25 years in the hospitality industry, John Wood set up his own consultancy business in 2007.